We do certain things for our pets to protect them. We vaccinate our pets to thwart diseases like rabies, parvo virus, and distemper. Recently, micro-chipping pets has become popular so that if our pets become lost they may be more easily returned to their home. We also do some things to our pets: things that are for our convenience, not necessarily for their welfare. Some practices that we once considered standard and traditional we now see as intrusive and hurtful. 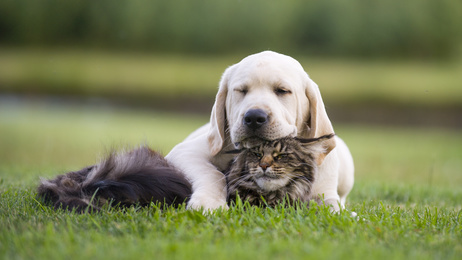 In the United States, both the tail-docking of dogs and the declawing of cats are two practices that are still all too common. How it started: The first recorded incidence of tail docking took place in Ancient Rome; Roman shepherds believed that removing the top of a dog’s tail on the “puppy’s fortieth day” prevented rabies. (1) Although the superstition passed long ago, the practice survived and, until recently, has been practiced all over the world. In 2006 the Animal Welfare Act banned tail docking in England and Wales for all dogs except dogs working in “law enforcement, armed services activities, emergency rescue, lawful pest control,” etc. The Animal Welfare Act also says the dog’s tail must be docked by a veterinary surgeon in the first five days of the puppy’s life. Besides impairing a dog’s ability to communicate, cutting off a dog’s tail may handicap the dog in other ways. Nerve fibers can try to regenerate at the stub and cause severe pain. Dogs may experience "phantom pain", severe discomfort in an appendage that is no longer there. Tails also help our dogs to balance while running, jumping, and swimming. Tail-docking deprives dogs of one of their main ways of communicating. Dogs communicate with their tails. We’re all familiar with the friendly tail wag, but tails are used for much more than showing pleasure or excitement. For instance, the expression “tail between his legs” comes from a dog’s dejected-like conduct when he is in distress. Randy Jackson’s Geico “Dawg Show”commercial shows a good representation of a Poodle and and Airedale using their tails to communicate. Cats can be destructive. Claws can eventually ruin your couch, your curtains, your carpet, and even your fine wood furniture. Landlords often ban cats for fear they will destroy furniture and/or carpets. Some landlords allow cats but demand exhorbitant damage deposits from those tenants that have feline friends. Too often, instead of investing the time and care that commitment requires, the cat guardian looks for the easy way out. When a cat is declawed, worries about claw damage are resolved — or so we think. However, declawing a cat can compound problems for both the cat and her guardian. Scratching is a form of isotonic exercise which both strengthens muscles and keeps muscles and joints supple. Scent glands located on a cat’s feet mark an area as “his” territory. Scratching relieves stress whether it is caused by irritation, discomfort, or simple boredom. Claws provide protection, balance, and heighten agility. A cat outdoors is almost entirely defenseless without her claws. Often you will see a cat scratching the base of a tree before he begins climbing. In addition to sharpening his claws, scratching helps shed old or damaged claw sheaths, making it easier for him to get a good grip as he climbs. Declawing isn’t an easy operation. Medically it isn’t even easy to say. It’s called onychectomy. Declawing isn’t just removing the talon; it’s a surgical procedure that entails amputating each of the cat’s “fingers” to the first joint of her paws. However, the good news is that there are a many alternatives to declawing. Sisal covered scratching posts and cardboard scratching pads. Nail clippers or rotary sanders such as Dremel or Pedi-Paws. Vinyl nail caps such as Soft Claws and Soft Paws. Declawing and tail-docking are rarely done to benefit our pets. Our animals can’t tell us no. It is up to us to make the right choices for their care. It is important to draw a clear line to seperate the things we do for our pets from those things we do to them. “The Weird Reasons Why Humans Started Docking Dog Tails.”. BarkPost, September 1, 2015. “How Docked Tails Cut Off Doggy Communication.” The Spruce. Accessed January 12, 2018. “Reasons to Avoid Tail Docking in Adult Dogs.” The Spruce. Accessed January 12, 2018. .
“Onychectomy.” Wikipedia, December 24, 2017. “Declawing Cats and Humane Alternatives.” Accessed January 5, 2018. . Alternatives to Declawing: “5 Sane Alternatives to Declawing Cats" - Catster. Accessed January 5, 2018.